1. Leader of the Jews against the Romans in the fourth century. When the Jews in Palestine were severely oppressed by the Roman general Ursicinus (351) they made a desperate attempt at revolt, which soon ended in their destruction. At their head stood a man who is called in Greek sources "Patricius" and in Jewish "Natrona." The latter name has a Messianic meaning and is not individual. The Jews gained possession of the town of Sepphoris (Diocæsarea) and of a few neighboring places; but they were soon subdued by Ursicinus (Pesiḳ R. iii., end, ed. Friedmann; Socrates, "Historia Ecclesiæ," ii. 33; Sozomen, ii. 33; Aurelius Victor, in the "Life of Constantius"), Sepphoris, Tiberias, Lydda, and many other cities being destroyed by the Romans (Jerome, "Chronicon," 283d Olympiad).From a passage in the Midrash referring to these events, where it is said that Nehemiah b. Ḥushiel (again a Messianic name) died before the gates of Jerusalem in the war against Constantinople (= Byzantine empire), it may be concluded that Patricius was killed in the battle; but the whole matter has not yet been cleared up. 2. The father of Patricius ( ; B. M. 5a; Ḥul. 64b). 3. Rabbi Patricius, brother of R. Drusus. He transmitted a statement of Abba b. Abina concerning the composition of the metal called in the Bible "gold of Ophir" (Yer. Yoma 41d; Ex. R. xxxv. 1; Cant. R. iii. 17; Num. R. xii. 4; Bacher, "Ag. Pal. Amor." iii. 527). 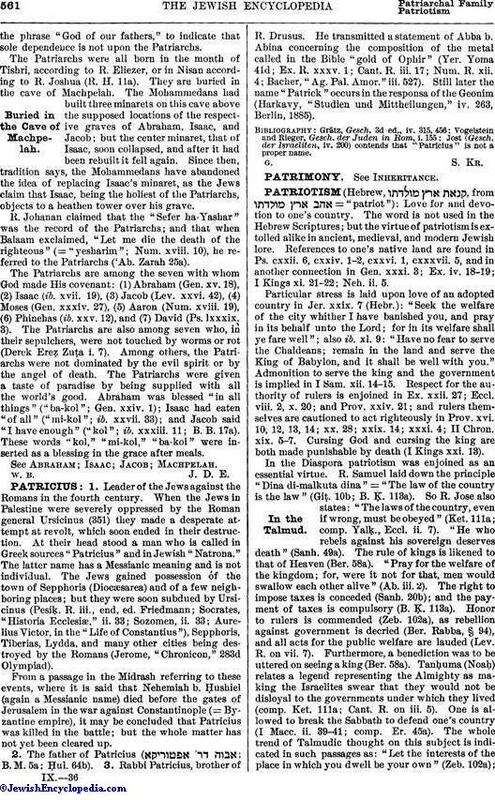 Still later the name "Patrick" occurs in the responsa of the Geonim (Harkavy, "Studien und Mittheilungen," iv. 263, Berlin, 1885). Jost (Gesch. der Israeliten, iv. 200) contends that "Patricius" is not a proper name.